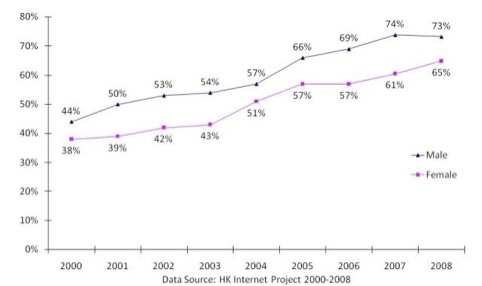 This is a longitudinal study of the diffusion, use, and impact of the Internet in Hong Kong, with telephone interviews of 1,000 residents (including both users and nonusers) conducted every year since 2000 (http://newmedia.cityu.edu.hk/hkip). 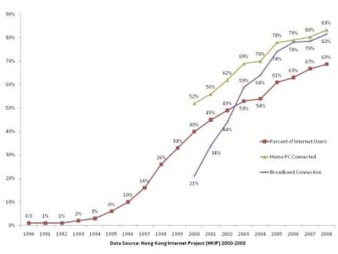 This is also a comparative study with core questions asked by other teams of the Asia-Pacific Internet Research Alliance (APIRA) in mainland China, Japan, Korea, Taiwan, Macau, Malaysia, and elsewhere, and/or teams of the World Internet Project (WIP). The study has been funded by two HKRGC Competitive Earmarked Research Grants, a CityU Strategic Research Grant, and CityU Centre for Communication Research.